When other countries shut down for the winter, Sweden comes to life. Roaring snowmobiles and sleds led by yapping huskies whisk you through a pristine wilderness of snowy banks and towering firs. Along the way, you’ll stay in unique lodging that ranges from idyllic log cabins to triumphs of Scandinavian minimalism all set again a craggy, mountainous backdrop. As the nights grow longer and rainclouds roll away, winter becomes the go-to season to spot the ranging beauty of Sweden's Northern Lights. Head north to the Arctic Circle – perhaps to the Luleå Archipelago – where tours are most rewarding. There’s even the Bjorkliden Aurora Festival, which runs every January and features talks from experts and photography lessons along with chances to spot the display. Of course, many people come to Sweden for its snow-based fun alone. 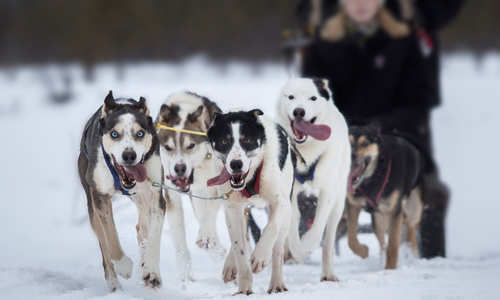 Snowmobiles – often the most pragmatic mode of transport – offer the perfect combination of excitement and practicality while dogsledding puts you in touch with the region’s traditions and indigenous people. It’s also the most atmospheric way to reach those hard-to-find Northern Lights viewing spots. Alternatively, go at a more relaxed pace with snowshoes or on cross-country skis as you make your way through fields of snow. During winter, Swedish Lapland comes into its own. Traditional log cabins and outdoor saunas make for idyllic stays while frozen lakes are ideal for all sorts of arctic adventures detailed above. Otherwise, take things a bit slower with ranging hikes through pine forests or stick to its cities for world-beating cuisine and design principles realised around every corner. 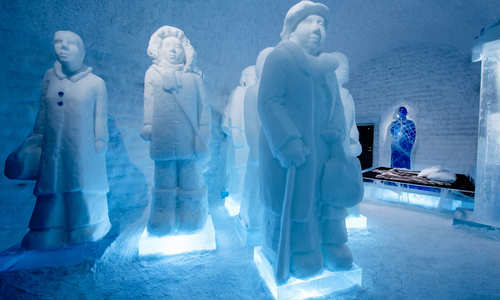 For less traditional accommodation, wrap up warm for a stay at the iconic ICEHOTEL, the first of Sweden's ice and snow hotels. Here, you’ll sip cocktails at the ice bar before retiring to rooms adorned in carved statues, set iridescent by tasteful lighting. Thankfully, thermal sleeping bags and reindeer skins bring some warm respite, as will your morning’s hot lingonberry juice and trip to the sauna. For something just as unique, look to the artistic visions of the treehouse in the inimitable Treehotel. Here, you can stay in a seemingly levitating UFO or in an oversized ‘birds nest’ all strung among a pine forest canopy. There’s also the romantic Aurora Safari Camp. Combining safari sensibilities with Sámi design and culture, its remote, tented accommodation is lit only by natural light sources and heated by open fires. As the brainchild of esteemed photographer Frederick Broman, it’s designed to give guests an unparalleled Swedish Northern Lights experience.